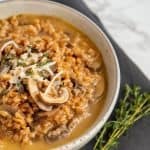 This easy Instant Pot mushroom farro risotto is the perfect healthy weeknight dinner with earthy mushrooms and nutty, whole grain farro. 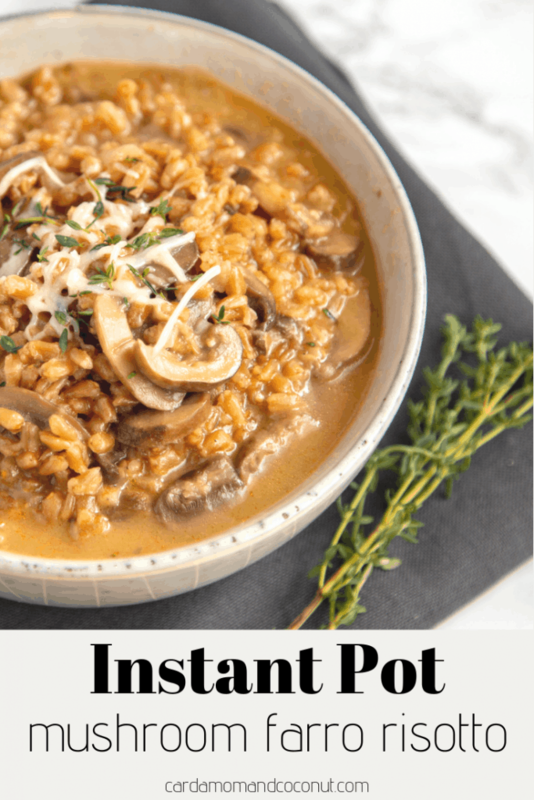 Risotto has always been one of my favorite Instant Pot dishes. It was one of the first dishes I ever made in my Instant Pot and has turned out perfectly ever since. Risotto is such a labor of love on the stovetop, and so simple in the Instant Pot. Start by turning the Instant Pot on “Saute” and press the Saute button until it’s on “More.” Add the butter to the stainless steel pot. When it’s melted add a finely chopped onion and cook for about a minute. Then add sliced mushrooms and cook for 3 more minutes, stirring occasionally. You can use any type of mushroom here – I’ve made this successfully with shiitake, baby bella, and white button mushrooms before. Finally, add some garlic and saute for another minute. Add the farro and vegetable broth and stir, scraping up anything that has stuck to the bottom of the pot. This helps to prevent the dreaded “Burn” error. Note that if you do get a “Burn” notification it sounds a lot worse than it is. It just means that some stuff is stuck to the bottom of the pot. It happens to me when I haven’t used enough liquid or when I’ve used a tomato- or cream-based sauce that is touching the bottom of the pot. To remedy the situation, release the pressure, open the lid, and stir well, scraping up any bits on the bottom of the pot. Try turning the Instant Pot on again for the remaining time. If it burns again, then release the pressure, take off the lid, and turn the pressure cooker on “Saute” to cook the rest of the way. Lock the Instant Pot lid in place. Close the pressure release valve and press the “Pressure Cook” button until it’s on “Normal” and press the “Pressure Level” button until on “High” (High is the default). Press the +/- buttons until it says 00:10 for 10 minutes. When done, let the Instant Pot naturally release for 10 minutes (just do nothing and it will start counting up). Then press the “Cancel” button to turn off the Instant Pot and quick release the remaining pressure by opening the pressure valve, steering clear of the steam. After the pressure is released and the float valve falls, remove the lid. It will still look a bit soupy. Turn the Instant Pot back on “Saute” and leave to simmer uncovered for about 3 minutes, stirring frequently. Then add the Asiago cheese, thyme, and salt and mix in well. Turn off the Instant Pot and serve. Looking for more Instant Pot rice dishes? Check out this Instant Pot enchilada rice, shrimp risotto, or easy rice and beans. 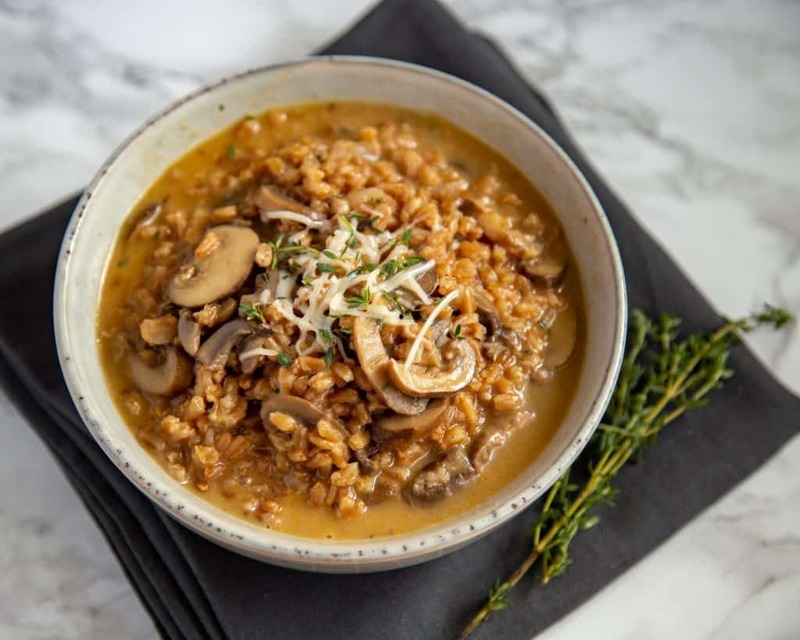 If you try this recipe for Instant Pot Mushroom Farro Risotto, leave a comment and a review below to let me know how you liked it! 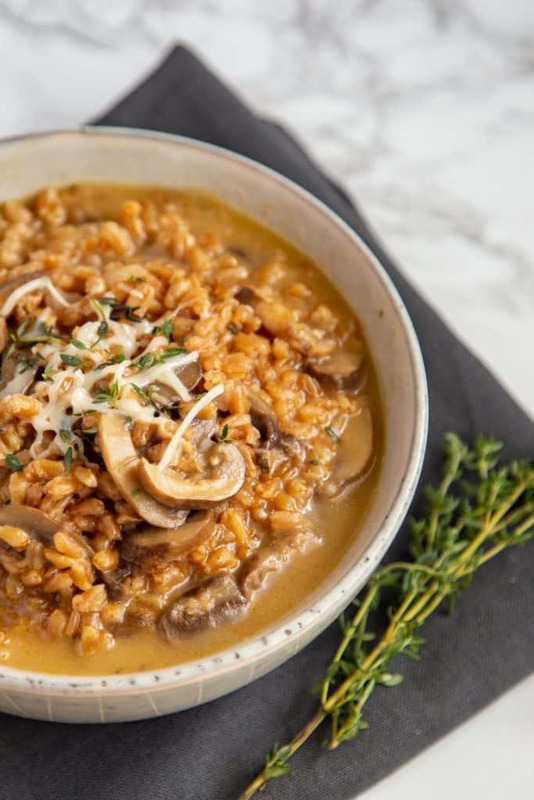 This easy Instant Pot mushroom farro risotto is the perfect healthy weeknight dinner with earthy mushrooms and nutty farro. Place the stainless steel pot in the Instant Pot. Press the “Saute” button until it’s on “More.” Add the butter. When the butter is melted, add the onion and cook for about a minute, then add the mushrooms and saute for 3 more minutes. Finally, add the garlic and cook for another minute, stirring occasionally. Add the farro and broth and stir, scraping up anything that has stuck to the bottom of the pot. Then lock the lid in place. Close the pressure release valve and press the “Pressure Cook” button until it’s on “Normal” and press the “Pressure Level” button until on “High” (High is the default). Press the +/- buttons until it says 00:10 for 10 minutes. After the pressure is released and the float valve falls, remove the lid. It will still look a bit soupy. Turn the Instant Pot back on “Saute” and leave to simmer uncovered for about 3 minutes, stirring frequently. Then add the Asiago cheese, thyme, and salt and mix in well. Turn off the Instant Pot and serve. This looks like pure comfort, I love it! Good luck! Let me know how it turned out for you!